Makuleke is a 24 000ha private concession between the Luvuvhu and Limpopo Rivers, and has huge habitat diversity, including tropical riverine woodland, mountainous bushveld and sandveld, extensive vleis and floodplains, Mopane scrub and woodland, and thorn thickets. The Makuleke community traded a successful land claim here for a stake in a private sector partnership, which will develop a protected wildlife area in accordance with Kruger guidelines. This has put a stop to the extensive poaching that had depleted the local animal life. From mid-2005 game levels have increased noticeably. The area has huge habitat diversity, including tropical riverine woodland, mountainous bushveld and sandveld, extensive vleis and floodplains, Mopane scrub and woodland, and thorn thickets. The north-east part of Makuleke is the driest part of Kruger with little grass cover beneath the scrub-like thornveld. It receives barely 200mm of rain a year, less than half the Park's average. Interestingly, this arid pocket of eastern thornveld attracts birds traditionally associated with drier south-western Africa. Pafuri rangers report irregular sightings here of the Crimson-breasted Shrike, Three-banded Courser and White-browed Sparrow-weaver. 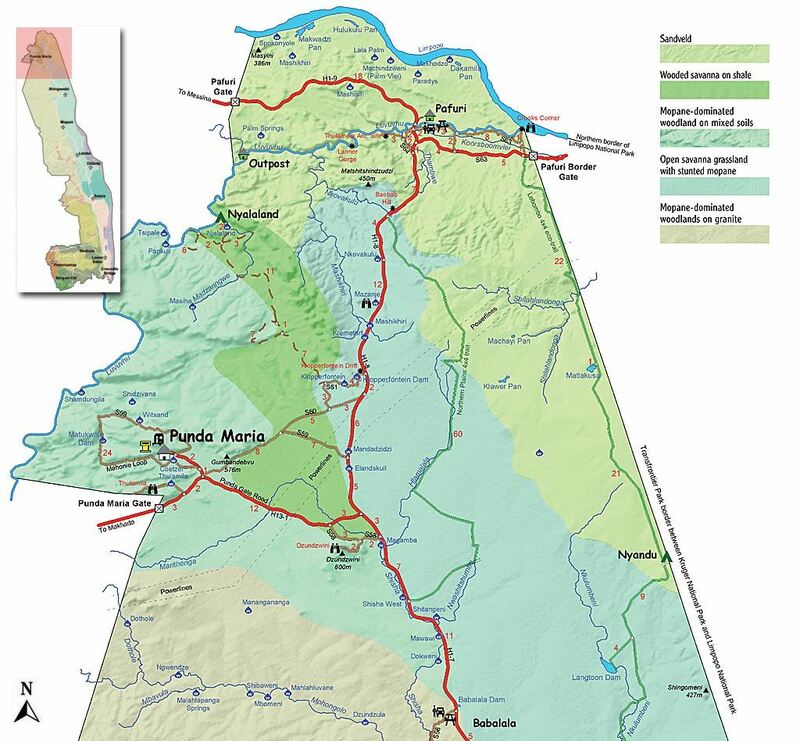 Makuleke Concession has only a single public road, the H1-8. This is the main road through the mopaneveld from the Luvuvhu River Bridge to Pafuri Border Gate into Mozambique. Birding opportunities are rather limited along this road and for the true Makuleke experience one has to book into one of the Lodges, which offer guided game and birding drives. According to Chris Roche of Wilderness Safaris the concession specialities include the Böhm's and Mottled Spinetails, Three-banded Courser, Lemon-breasted Canary, Black-throated Wattle-eye*, Pel's Fishing-Owl, Tropical Boubou, Green-capped Eremomela, African Yellow White-eye, Grey-headed Parrot, Arnot's Chat, White-breasted Cuckoo-Shrike, White-crowned Lapwing*, Meves's Starling*, Racket-tailed Roller, Thick-billed Cuckoo (in summer) and Senegal Coucal. Other regular sightings include the Bronze-winged Courser, Crested Guineafowl and Mosque Swallow. One of the best guided drives in the Makuleke is upstream along the Luvuvhu to Lanner Gorge, which is one of the most spectacular viewpoints in Kruger, with sweeping vistas over miles and miles of pristine wilderness. The gorge, carved by the Luvuvhu River through deep sandstone cliffs, was named by ranger Mike English who first reported that the inaccessible rock faces were a Lanner Falcon breeding site. Lanner and Peregrine Falcons are often seen hunting close to the gorge. There are a series of pans along the Limpopo that fill up quickly after heavy rains and can attract huge flocks of waterbirds. Up to 200 Yellow-billed Storks have been seen here as well as less common Kruger species such as the African Pygmy-Goose and Great White Pelican. Spokonjole and Makwadzi Pans next to the Limpopo River are African Openbill breeding sites. Up to 40 individual nests have been recorded at Spokonjole during wet years. Openbill Stork numbers in Kruger are at their lowest during dry years when this regional nomad seeks vleis and watercourses elsewhere. Nwambi Pan is a parallel channel to the Luvuvhu River near the famed Fever-tree forests of the Makuleke. It is an excellent summer birding and winter game-viewing site. Golden-tailed and Bearded Woodpeckers are active in the area. White-bellied Sunbirds are evident in winter when the Anisotes formissus shrub is in flower. Reedbuck Vlei is a seasonal waterpoint in a big area of marshland that is a productive summer birding site. Pel's Fishing-Owl is one of the Park specials that can sometimes be seen from the Luvuvhu River Bridge or Pafuri Lodge at dusk. They become active late in the afternoon, hunting usually from a long, low branch above pools of slow-flowing water, or else from a sandbank. Their diet is almost exclusively fish, but they have been known to take crocodile hatchlings and ambush guineafowl having their last drink of the day. Pel's hunts fish by swooping down to the water, wings outstretched, and plucking its prey from the water. This rufous-coloured owl has been seen diving completely below the water in its pursuit of its main prey - catfish, tiger-fish, bream or pike. 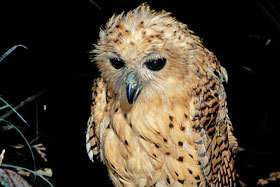 According to Roberts VII, there are 30-40 breeding pairs of Pel's Fishing-Owl in Kruger, eight are of which nest along 18km of the lower Luvuvhu River. There are another two known nesting pairs along the Olifants River and a further two along the Sabie River, near Paul Kruger Gate. During daylight hours, pairs perch close to each other in the canopy of large trees like the Sycamore Fig or Natal-mahogany. Often their daylight roosts are evident from fish bones and pellets on the ground. Their sonorous night-time hoot and grunt can be heard up to three kilometres away. Pel's has an intense dislike of Verreaux's Eagle-Owl, and these species have been known to fight to the death over disputed roosting sites. Pel's is also competitive with the African Fish-Eagle, which mobs the owl if it appears during the day. Although it has a wide range in Africa, extending to northern Ethiopia and Senegal, Pel's is a threatened species because of human encroachment on its marshland and riverine habitat. It was first recorded for science in the Ashanti area of Ghana and was named after the governor of the Dutch Gold Coast, HS Pel, who died in 1854. See Pel's Fishing Owl. One thing the Makuleke is not short of is Baobabs, which thrive in the basalt soils and dry, hot conditions. Some of the bigger trees may be over 4 000 years old. They would not have grown much since the 15th century when the Thulamela dynasty ruled the Limpopo. Baobabs are ecosystems on their own, supporting communal nests of Red-billed Buffalo-Weavers and providing nesting holes and food for kingfishers, rollers and hornbills. Two species closely associated with Baobabs are Böhm's and Mottled Spinetails. The Outpost is the northernmost lodge in Kruger. Situated high in the sandveld koppies near Pafuri Gate, it is unashamedly contemporary, using steel, canvas and clean lines in contrast to the conventional safari aesthetic. Outpost has 12 stand-alone, luxury units linked by a walkway that offers magnificent views over the Luvuvhu River valley. Among the camp specials are Scarlet-chested Sunbirds, Broad-billed Rollers, Red-headed Weavers, Black-throated Wattle-eyes, as well a number of owls and owlets, including Pel's Fishing-Owl, Pearl-Spotted Owlet and Verreaux's Eagle-Owl. Outpost offers game drives, walks, and river safaris.